Following hot on the heels of their change of brand special (Imperial Car Rental became Europcar on 1 June), Europcar are offering another interesting special. Rent for 3 days and only pay for 2. 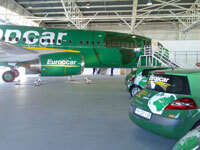 Europcar’s giving one day free rental when you rent with them for a minimum of 3 days and a maximum of 7. Offers start at R330 for three days including 600 kilometres, standard waiver, surcharges and VAT. Standard Rental Terms & Conditions apply; valid for credit card rentals only; vehicles subject to availability; final reservation date is 29 August 2009; Valid for rentals checking out on or before 31 August 2009. This offer applies to rentals anywhere in South Africa. Rentals of less than three days cannot be booked under this special.